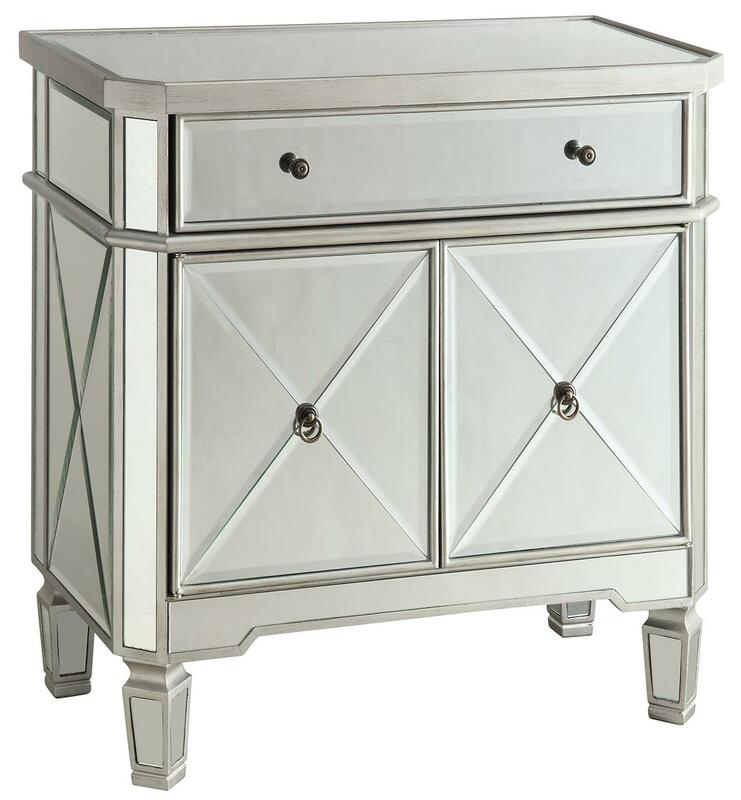 Go glam in your living room or dining room with this cabinet outfitted with mirror panels. Perfect for use as a storage cabinet or home bar cabinet, it features one drawer, two doors, and two shelves. The center lower shelf includes a removable wine holder. The Accent Racks Mirror Panel Wine Cabinet with Removable Wine Rack by Coaster at Lapeer Furniture & Mattress Center in the Flint, Michigan area. Product availability may vary. Contact us for the most current availability on this product. Storage 1 drawer, 1 door, 2 total shelves. 1 shelf includes removable wine holder. It's always nice to have a home that is well organized and presented. Luckily, with the Accent Racks Collection, this will become an easy task with your choice of a variety of open bookshelves, magazine/DVD racks, and corner display units. The collection ranges from metals, marble, to woods with dark and light finishes. You can also choose different style items such as traditional, modern and contemporary to better match your existing home decor. Either way, you'll find that your home will look cleaner, fuller, and well showcased in no time! The Accent Racks collection is a great option if you are looking for furniture in the Flint, Michigan area. Browse other items in the Accent Racks collection from Lapeer Furniture & Mattress Center in the Flint, Michigan area.